In unity with the community charity 2009, “Million Peso Campaign” a fund raiser for raising funds for the many projects we are implementing this year. We have a non-profit Foundation. Now since 2009, “The Rotary Club of Central Mactan” an International Service Organization which has a motto that all Rotarians aspires – Service Above Self the means by which our club has been able to support various charities and community needs financially, and through physical participation throughout the Province of Cebu mainly in Lapu Lapu City. The needs of many are now magnified due to our current economy. It is with our utmost humble request that we seek your support of our Community Service Projects. Help the Rotary with our commitment for ” In unity with the community charity 2009, “Million Peso Campaign” a fund raiser for raising funds for the many projects we implementing this year. 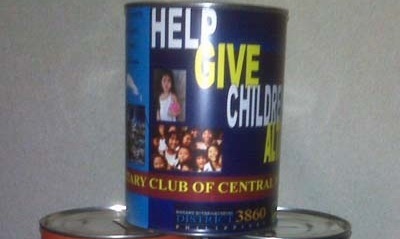 Allow Rotary to place a donation can besides your cash register will entice patrons to donate their loose change. With the funds raised we will continue to serving our community with support for our local and secondary School scholars, programs for children with special needs and surgeries, International work with Eradicating Polio Plus and financial assistance for the never ending quest for clean drinking water.